Some 17% of all Hispanic eligible voters live in this year’s battleground states—Colorado, Florida, Iowa, Nevada, New Hampshire, North Carolina, Ohio, Virginia and Wisconsin.6 And among eligible voters in the battleground states, 8% are Hispanic. 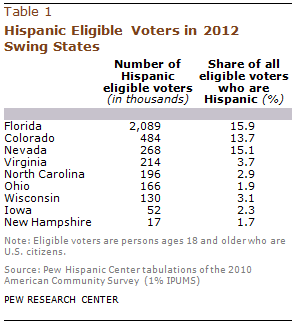 In some battleground states, there is a sizeable number of Hispanic eligible voters. For example, in Florida there are more than 2 million Hispanics who are eligible to vote, making up 15.9% of the state’s eligible voters. However, most potential Latino voters do not live in battleground states. More than half (55%) live in just three states—California, Texas and New York. When other non-battleground states with large Latino populations are included—Arizona, Illinois, New Jersey and New Mexico—two-thirds (68%) of the Latino electorate is accounted for. Nonetheless the presence of Hispanics in this year’s battleground states has grown since 2008. The battleground states of Florida, Colorado and Nevada each have large Hispanic populations that have grown in size and share since 2008. In Florida, for example, the number of Hispanics eligible to vote grew by 244,000 between 2008 and 2010. Their share also increased, rising to 15.9% from 14.5% in 2008. In Virginia and North Carolina, Hispanics are also a larger presence among eligible voters in 2012 compared with 2008, though their shares remain small—3.7% and 2.9% respectively. In some other battlegrounds, the number of Hispanic eligible voters is below 2%. For example, in Ohio, while there are 166,000 Hispanic eligible voters, they make up just 1.9% of the all eligible voters there. In the case of New Hampshire, the size and share of the Hispanic electorate is even smaller—17,000 and 1.7%, respectively.